The Federal Reserve is widely expected to raise short term interest rates before the end of the year. This is more than just the opinion of analysts. The expectation of another rate hike is built into the market price of Fed Funds futures. Banks are required to hold minimum amounts of cash as reserves. Federal funds, usually called Fed Funds, are the amount of reserves that are above the minimum requirement banks hold at Federal Reserve banks. Managers at banks know that excess reserves are a wasted asset that doesn’t generate income. So, they will lend any excess reserves they have to other banks. Most of these loans are for one night and used by the other bank to meet its minimum reserve requirements. The interest rate on these transactions is low, and is informally set by the Federal Reserve. The Fed sets a target rate. If the actual rates move too far from the target, the Fed intervenes in the market to bring the rate in line with its target. That makes the Fed Funds rate an important interest rate. The market for Fed Funds is large, with transactions often measured in billions of dollars. With so much money at risk, banks have implemented risk management policies. Many of these policies use futures contracts to offset perceived risks. In this case, a futures contract is an agreement to buy or sell a particular financial instrument at a predetermined price at a specified time in the future. Futures are in many ways like options contracts. And, as they have with options, exchanges have developed standardized contracts to facilitate trading. Contracts for Fed Funds are traded and the prices of those contracts can be used to find the interest rate traders expect to see when the contract expires. These contracts provide analysts with a probability of a rate hike. The CME, the exchange where Fed Funds futures are traded, updates the probabilities of a rate hike on their web site. The chart of the probabilities for the December contract is shown below. The Fed sets a target range for Fed Funds. Right now, their target is an interest rate of 1.0% to 1.25%. Traders convert this percentage to basis points, or bps (pronounced bips). A basis point is 0.01% so 100 bps is 1%. The chart above is in bps. The current target rate for Fed Funds is 100 to 125 bps. 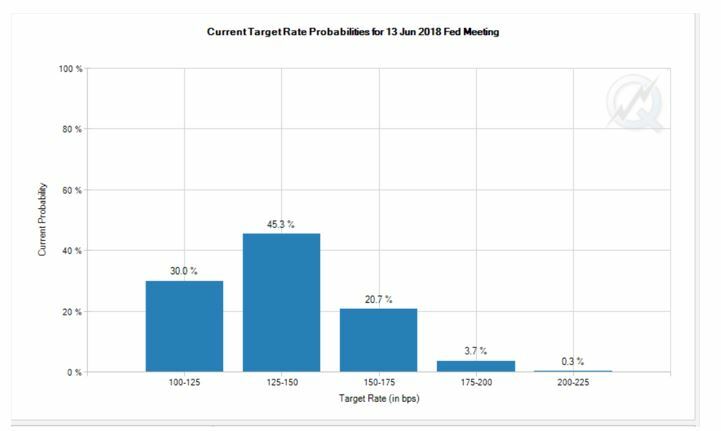 Traders are pricing in a 46.8% probability that the target rate will be increased to a range of 125 to 150 bps, or 1.25% to 1.50% at the December 13 meeting of the Fed’s Open Market Committee. 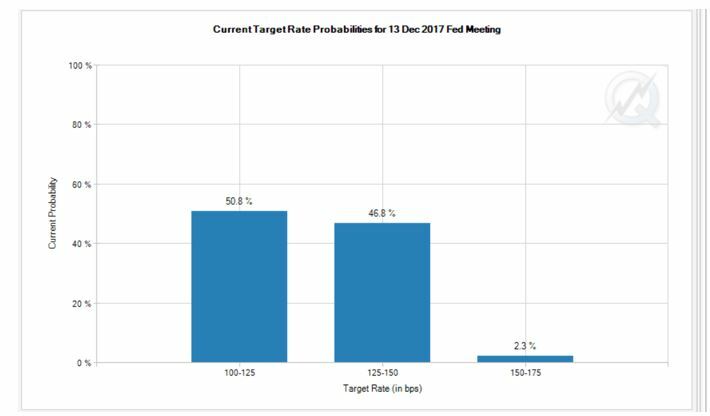 There is a 50.8% probability rates will remain unchanged after that meeting and a small chance (a 2.3% probability) of two interest rate hikes before the end of the year. There is a 70% probability of an interest rate hike within the next year. Traders are pricing in to Fed Fund futures contracts a 30% probability rates will remain at the current level after the June 13, 2018 meeting of the Fed’s Open Market Committee. As rates rise, bond prices fall. This is true because there is a market for bonds. If a bond is issued with a rate of 1% and a price of $1,000, traders will refuse to pay $1,000 for that bond if rates rise to 5%. To entice buyers to accept the 1% rate on the old bond, sellers will have to lower their price. This process unfolds immediately as interest rates change and affects all bonds, from all issuers over all maturities. This fact means the trend in bond prices will reverse for the first time in more than 35 years. Interest rates have been on a declining path since they peaked in August 1981. Interest rates on 10 year Treasury notes topped 15% in 1981 and fell below 2% last year before rising to about 2.3%. This has resulted in the extraordinary trend in bond prices shown in the next chart. The trend has in prices has been generally higher since 1981 although there have been down moves along the way. The reversal in interest rates will not affect all bonds the same way. Bonds with longer maturities will decline in price more than bonds with shorter maturities. The size of the loss can be estimated with an indicator called duration that is available for bonds and bond funds. For example, based on its duration, we can expect the iShares Short Treasury Bond ETF (NYSE: SHV) to fall by 0.41% for each 1% increase in interest rates. This fund holds bonds and notes with less than a year to maturity. iShares 7-10 Year Treasury Bond ETF (NYSE: IEF) holds bonds that have more time to maturity. This fund is expected to lose 7.53% of its value for each 1% increase in interest rates. Long term holdings, like the portfolio of iShares 20+ Year Treasury Bond ETF (NYSE: TLT), will suffer the most in a rising interest rate environment. TLT is expected to lose 17.43% of its value for each 1% increase in interest rates. Although duration allows us to develop precise estimates of the size of the price drop, it is important to remember it is just an estimate and the actual price change is likely to vary somewhat from the estimate. It could vary, of course, in either direction and be more or less than estimated. Based on Fed Funds futures, there is a high probability rates will be higher at year end. To benefit from this, traders can buy put options on one of the bond funds highlighted above or a variety of other ETFs that offer exposure to fixed income investments. The most aggressive trade would be in TLT, the ETF that holds bonds with more than 20 years to maturity and is likely to move the most if long term interest rates move higher. The Fed does not directly control long term rates but long and short term rates tend to move in the same direction. There are options with expiration dates as far out as January 2019 available for TLT. Long term options provide more time for the trade to succeed but are more expensive to trade. A put option on TLT with an exercise price of $120 expiring in January 2019 is trading at about $5.90. A put option with the same exercise price expiring in December 2017 is trading at about $1.46. The risk, when buying an option, is always equal to 100% of the amount paid for the option. Since each option contract covers 100 shares, the risk for the January 2019 contract is $590 while the December 2017 contract requires risking less than $200. Trends in interest rates can last for years, or even decades. But, the cost of the longest term options may be prohibitive to many investors. To lower the costs of the trade, traders can view this as a series of trades. They could buy the December 2017 put option and when that contract expires, buy another put with six months or more to expiration. When interest rates do turn up, the losses in long bonds will be large. Using put options is one way that small investors can participate in that trend, potentially for years. A series of trades will provide long term exposure at lower cost than one very long term put option.